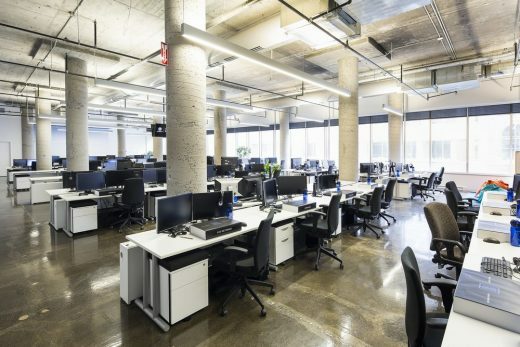 Ubisoft’s 400 video game creators located in Quebec City have been settling in to their new workspaces since last May. 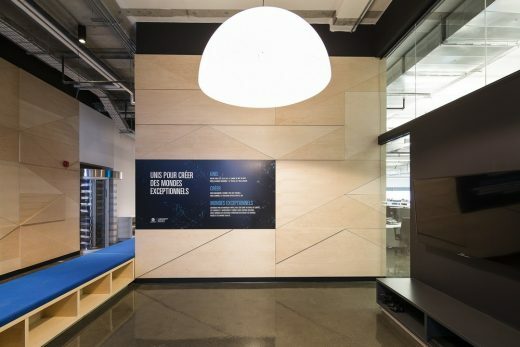 An ambitious relocation project, the design of this new studio was done in an integrated way under the direction of the firm Coarchitecture, mandated by Ubisoft Quebec for this architectural challenge. 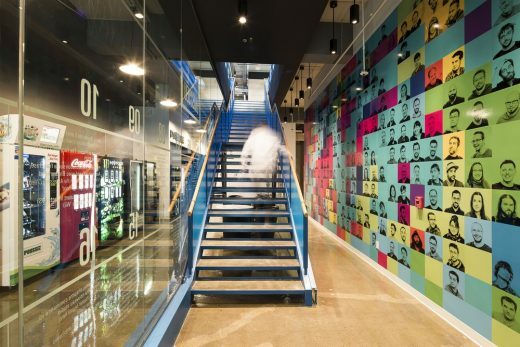 The lighting of these new spaces, designed to encourage creative projects, was at the heart of the conception and LumiGroup’s expertise was called upon to achieve all the of the project’s objectives, including the importance of creating an efficient, dynamic, and inspiring living environment, representative of Ubisoft’s DNA. 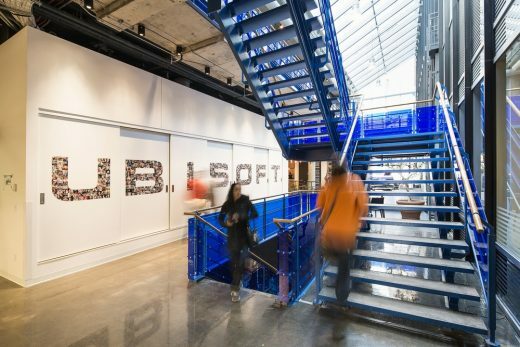 Over the past 11 years, Ubisoft Quebec’s studio has developed an internationally recognized expertise and has experienced significant growth, both in terms of the size and number of projects carried out. Originally made up of small production teams, the studio quickly reached a new level by developing triple A games, involving large-scale production. As this type of project requires very large teams and vast floor areas to facilitate synergy, a relocation of the studio became essential. Numerous meetings, discussions and brainstorming workshops were held between the various stakeholders and decision-makers throughout the development of the project. This integrated design process, crucial for Coarchitecture, adds value to the various work environments, by ensuring the overall comfort of the occupants. “We like to play as a team. When all parties are committed to a common vision of success, we achieve it, together!” underlines François Cantin, project manager at Coarchitecture. This team spirit represents well the overall concept of the project which is inspired by games, sports fields and the typical backyard; an organized and playful chaos where each teammate has the opportunity to move, play, work, exchange, collaborate and ultimately innovate. The studio’s space is articulated around an electric blue staircase, placed in the heart of the building, constituting the spine of the project. The fluidity, communication and interconnection between colleagues and diverse teams were the priority of the spatial organization. Thus, many collective spaces and meetings, formal or informal, revolve around this great dynamic breakthrough. Based on this integrated design process, the lighting was designed jointly by the architects and LumiGroup’s experts, to compose a coherent whole, in harmony with the general concept although represented through different forms. “The lighting design had to adapt to a multitude of spaces, each deploying a distinct universe, a special atmosphere” explains Nicolas Brassard, lighting consultant at LumiGroup. Certain traffic areas and public spaces are punctuated by industrial and robust style lighting fixtures (Lightheaded and Viscor Lighting), referring to the urban landscape, such as Quebec’s alleys, parks and garages. In contrast, warm fixtures that are more residential style, mark some meeting spaces, or the dining room, for a more intimate and cozy feel. Where informal meetings take place, halfway between the working space and the transition zone, the facilities reveal a large opening and a playful decor, focused on the concepts of outdoor spaces and seasons. The summer room features a swing with upward-facing lighting, Osram’s Linear Light Flex, and Absolux’s Keiko wall sconces, reminiscent of outdoor torches. The winter room offers a starry ceiling composed of several individual light bulbs, Absolux’s AX-4803 model, arranged at various heights. Then, a large park comes to cut the density of the large working place in two, allowing space and ideas to ventilate. The playful facet continues with the hut in the tree, a shelter made of wood, where the chosen light, the Droog Light by Castor Design, takes inspiration from the way guitar pedals are activated. Each light is turned on through pressing a switch like a guitar stomp box. 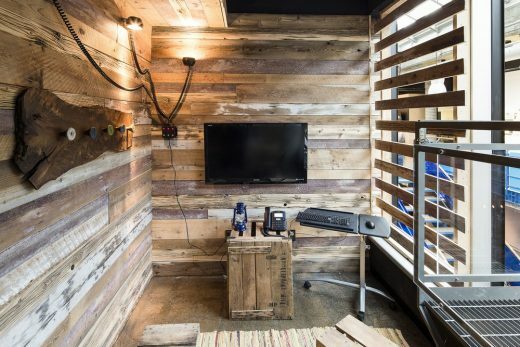 Rubber 12-volt truck lights plug into a power box using guitar jacks. The lights are placed wherever the user wants, using metal pucks and magnets. 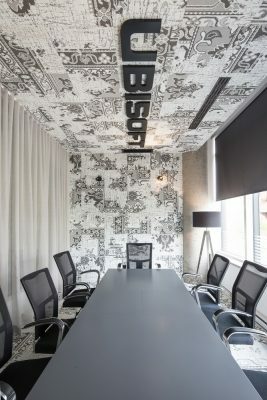 Other closed rooms, for more formal meetings, are also available for Ubisoft employees, each displaying its own color and personality. 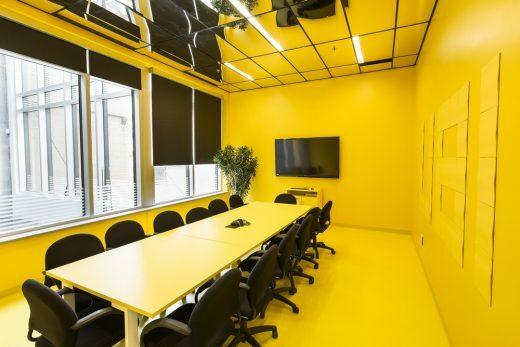 The Post-it room for brainstorming, boasts a bright yellow, with the aim of getting out of a comfort zone and pushing imagination and innovation to the maximum. The space is accompanied by fluorescent lights and mirrors on the ceiling to accentuate the vibrancy and brilliance of the place. Always by way of contrast, one of the conference rooms invites neutrality by its various shades of gray. A residential living room style floor lamp was chosen to make the space more intimate and relaxed. The open-space work platforms also presented a significant challenge. The work teams are mobile and some employees need a lot of light whereas for others, like graphic tablet users, they don’t need the same amount. Coarchitecture, in collaboration with LGT inc, created reduced lighting areas with individual switches and LumiGroup proposed a bidirectional luminaire that perfectly corresponded to this need for flexibility since it illuminates downwards, upwards or both, as required. Its minimalist and linear appearance also brings a certain sobriety to the workspace. Together with Coarchitecture and the various stakeholders, LumiGroup contributed to the development and enhancement of atmospheres with thoughtful and pertinent lighting. Sometimes subtle or even invisible, sometimes intimate and warm, other times sculptural and flamboyant, the lighting design meets the functional needs of the users while following the project’s main thread: the playground and team spirit. 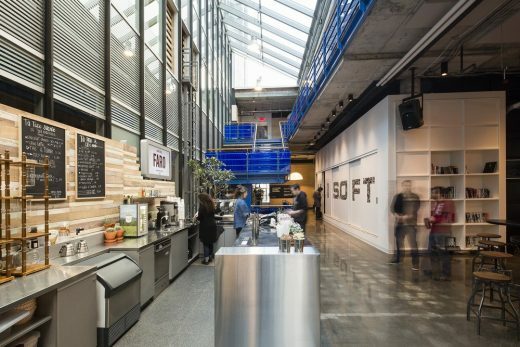 These gathering themes allow the expression of all the creativity that characterizes the workforce of Ubisoft, using diversified and heterogeneous spaces where each employee can find his comfort. LumiGroup, founded in 1995, is Quebec’s largest lighting agency. 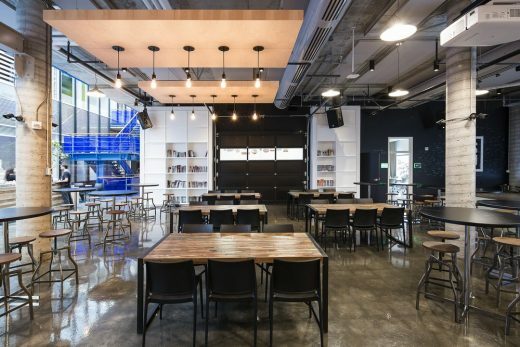 It represents a vast number of lighting manufacturers from Quebec and around the world, exhibited in a 10,000 square foot showroom in the heart of Montreal’s Mile End artistic district. LumiGroup creates, in collaboration with industry specialists, the right lighting solution, including fixtures and controls. Its mission is to creatively transform space in terms of functionality and ergonomics, to stimulate and motivate the end user. LumiGroup is proud to be ranked in the 2015 PROFIT 500: Canada’s 500 Fastest-Growing Companies. 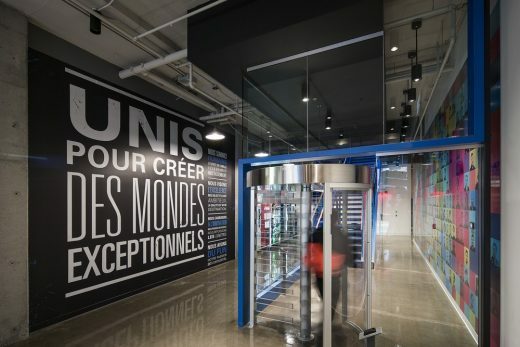 Only 44 Montreal-based companies have been ranked this year. 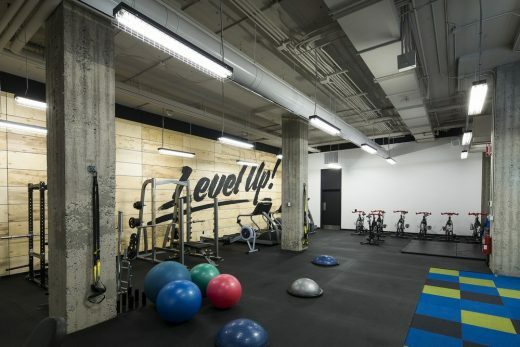 Based in Québec City, Coarchitecture has 40 team players, including 4 LEED certified professionals. This team is one of the most important architectural work forces in the Quebec City region. The Co of Coarchitecture signifies collaboration, reminiscent of the company’s distinctive culture. Its mission is to create with its customers and partners remarkable and sustainable places. Aware that the success of a project rests on the spirit of partnership within a large value chain, Coarchitecture builds on this collaborative culture to nurture value-added innovation and mobilize all stakeholders. Coarchitecture celebrates 40 years of practice this year.